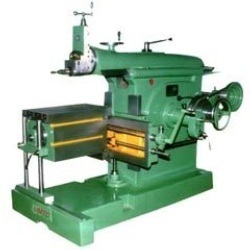 We manufacture a precision engineered range of Shaper Machines is customized as per the specifications of our clients. These are designed using latest CAD software and are developed using high grade raw material. We check our entire range over certain parameters so as to assure the delivery pf shaper machines which are high on performance and have a long service life. Used in various industrial applications, our range of Shaper Machines is manufactured using high grade raw material. These shaper equipment are designed and developed using latest cad software and offers excellent performance even in rugged conditions. While manufacturing our range, we make sure that the entire production procedures are checked for quality. This ensures that the machines that we offer are high on performance, serviceability and efficiency. All size in inches 18" 24" 30" 36" 40"
H. P. Of electric motor 2 H.P. 2 H.P. 3 H.P. 3 H.P. 3 H.P. Dia of motor pulley 2" 2 1/2" 2 1/2" 2 1/2" 2 1/2"
Looking for Shaper Machines ?